Hi, I have temperature sensor lm35 and Atmega8A-PU. now i use this code to read the value and i display it on one number led display by showing the numbers gradually. E.g. if the temperature is 18.5 the display will show 1 then 8 then 5.. The problem is, I am indeed getting about 18 degrees in a room that has 22.3 degrees, is there something wrong with my code? Or is the temperature sensor malfunctioning? Please don't mess about with trying to describe circuit connections in text - draw a schematic! Then there is something very fundamentally wrong!! Probably, you have the connections wrong - VDD and GND swapped, perhaps? is the temperature sensor malfunctioning? Once it has got "insanely hot", it has probably been damaged. Well the sensor is probably damaged at this point so I would throw out the current one and replace it with a new one and DOUBLE CHECK your connections. As far as the code is concerned, I believe the LM35 outputs 10mv/C IIRC, so how have you set your reference voltage for the ADC for example? How do you have AVcc decoupled? As far as using single conversions go, I would take multiple readings and average them together. Ok I will throw it away and need to buy a new one first. Note that it is a convention (not entirely rigid) that schematics should generally read left-to-right - so inputs are on the left, and signals "flow" to the right. The resistor remains a puzzle - you certainly should not need it, and your LM35 certainly should not get hot. Something is still fundamentally wrong. Are you sure it's an LM35? You've labelled its output as "DQ" - but that's not what the linked tutorial calls it, nor what the datasheet calls it. You haven't actually got a DS1820 or suchlike instead - have you ... ? omg, you're right. I am still a beginner and when I asked for LM35 in a shop I actually got DS18B20 (https://www.gme.cz/data/attachments/dsh.530-067.1.pdf) without even realizing. I am sorry, this is stupid. The thing is I was looking into the correct spec, so I connected the wires correctly. If I put the resistor as shown on jgmdesigns schema, the sensor gets hot, only if the resistor is put as drawn on my schema, the sensor remains cool. I don't know why. Like you knew you were using an LM35? Now which one are you planning on using as both devices have VERY different outputs. 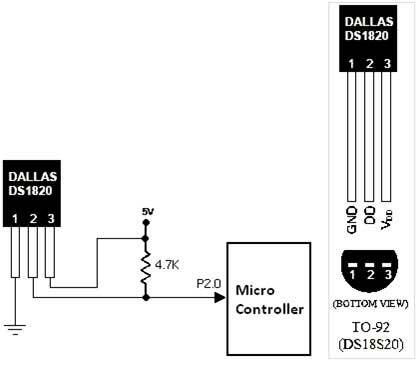 The LM35 has an Analog output, the DS1820 has a digital output. right now, I'd like to try more with current DS1820, even though I don't know if its still okay, but I can't get my hand on anything else until monday. 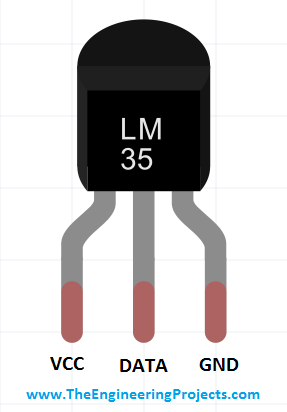 Then I would consider LM35 as it seems easier to handle. There is something very odd happening here. The active current for a DS1820 is 1mA. With that resistor in series with the power rail a 4.6V drop will happen across the resistor with means that on a 5V power supply the DS1820 will only see 0.4V so it can never work. And as it can never work it won't get hot. Ok, I had it in reverse, you know why? Because I didn't realize the schema in the doc is BOTTOM VIEW. There is so many new things for me and then such small details just evade my brain..grr.. So when I connect the wires correctly I get value of 0. I guess the sensor is already screwed. I think that is all for now, until I buy a new one. I get value of 0. The LM35 puts out an analog voltage, and one reads it with an ADC, does some math conversion, and gets the temperature. The DS18B20 is a DIGITAL temperature sensor. You have to read the data sheet. You have to send it digital commands, and read back digital data. All doable, but rather complex for a beginner if you are not using a canned library for the interface. With that resistor in series with the power rail ... it can never work. And as it can never work it won't get hot. But OP said it got hot without the resistor! I think that is all for now, until I buy a new one. Datasheet page 1: "Current drain < 60uA"
5V-280mV = 4V72 and LM35 should work down to 4V. Best guess: Sensor is fried, possibly a short somewhere. I don't really understand why anyone would order a single 50ct sensor while experimenting. I usually buy batches of 10 or so. Swapping out a sensor (uC) on a breadboard is a very fast and easy way to diagnose circuit problems / mysteries. Well, "retail" they're more like $2 (online, Digikey) - possibly even more, as it sounds like the OP actually got it from a local, physical store. The more accurate grades are even more expensive. Digikey wants $7.47 (quantity 1) to $3.187 (quantity 1000) for an LM35CAZ.